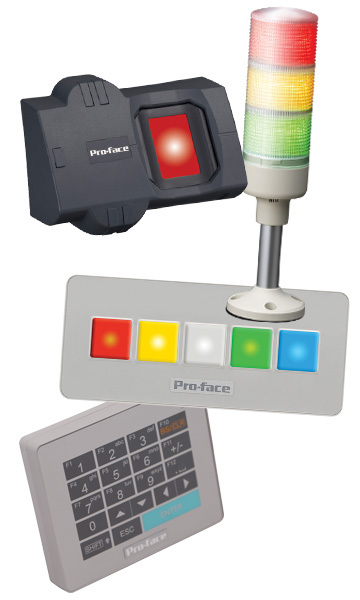 Pro-face EZ Series HMI accessories are easy to connect and powered by the USB port, easy to install with 22mm hole mounting, and easy to set up with GP-Pro EX. Forget passwords that can be shared, the EZ Fingerprint Recognition Unit provides security that can’t be surpassed. Fingerprint data is registered and maintained through the HMI or PC connected to EZ Fingerprint Recognition Unit. It can be configured for 15-levels of security and visibility, and data for up to 100 users can be stored. Increase the safety of your operators and operation while protecting the security of your data and application by using fingerprints for access. The EZ Tower Light makes your status system easier to understand by leveraging the multi-color LEDs which allows the flexibility to control 4 colors and 2 flash rates per unit. The EZ Illuminated Switch is a bank of 5 light-up buttons which can be configured in six different colors and 3 blink speeds. Use the easily printable insert labels to create dedicated pushbuttons. The EZ Illuminated Switch allows operations where tactile feedback is desired, like when the operator pushing the button but looking elsewhere. It can also be set to indicate alarm status with different colors. The EZ Numpad is an alphanumeric keypad that features the same 22-millimeter holes used to install hardware switches and lamps used on production work sites. The EZ LAN Adapter is a conversion adapter that attaches to the USB (Type A) interface on the display unit so you can use it as an Ethernet interface.